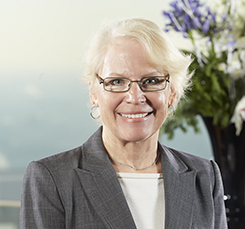 Karol concentrates her practice on corporate activities and regulatory issues of financial institutions, about which she has counseled banks for over 30 years. Her special emphasis is on the distribution of nontraditional bank products, including annuities, insurance, mutual funds, prepaid cards and other deposit account access devices, and the myriad of federal and state laws and regulations that apply to those activities. She is the author of Insurance Activities of Banks, the definitive text on that subject and the author of The Keys to Banking Law: A Handbook for Lawyers, Second Edition (2017). Karol’s national practice was anchored during her four-year term as Chair of the American Bar Association’s 1,900 member Banking Law Committee. She is a frequent lecturer on issues relating to the regulation of financial institutions and is one of the founders, and served on the faculty, of Banking Law Basics, a three-day primer on banking law, sponsored by the ABA-CLE, and presented twice annually in San Francisco and Boston from 1998 through 2010 and is one of the faculty of the successor program Banking Law Fundamentals sponsored by Boston University School of Law and Berkeley law School. Over 1,600 lawyers from across the United States and abroad have attended these courses. From 2001-2008, Karol taught banking and commercial law at the University of Iowa College of Law and has been a guest lecturer on banking law at the respective law schools of Northwestern, Boston University, American University and George Washington University. She was an adjunct professor at Wake Forest University School of Law, teaching contract drafting, secured transactions and financial services regulation, from 2008-2014, and is now a lecturer of law at the Boston University School of Law Graduate Program in Banking and Financial law. Karol is a past chair of the Banking Law Committee of the Business Section of the American Bar Association (1998-2002), having been an active member of the committee since 1985. She was a member of the Council of the Business Law Section of the ABA, the governing body of that organization, for a term ending in August 2008. As a member of the Council, she served on the Financial Committee and the Revenue Committee. Having been a member of the Publications Board since 2006, she was its Chair from 2012-2014. Freeing the Banks: What does Gramm-Leach-Bliley Do?